Exposure to nearby nature can effectively reduce stress, particularly if initial stress levels are high. Simply having a view of nature produces recovery benefits. Studies in Japan of 'shinrin-yoku" or "forest bathing" (explain) have found effects of improved immune system response, lowered stress indicators, reduced depression, and lower glucose levels in diabetics. Natural outdoor play spaces have been shown to foster focus and calm in children. We intuitively know that taking a walk in the woods or spending a few minutes by a river produces feelings of calm and wellbeing, but now there’s scientific evidence to back that up. Exposure to nature has been shown to significantly decrease stress and boost wellbeing. Chronic stress has been associated with an increase in the risk of conditions such as obesity, heart disease, Alzheimer’s disease, diabetes, depression, and asthma. The good news is, research shows that time in nature —or even just a view of trees —can significantly relieve stress, lower blood pressure, and support wellbeing. A 2010 study published in Environmental Health and Preventive Medicine, for example, found that participants who walked in a forest had lower blood pressure and levels of cortisol (the body’s stress hormone) afterwards than those who walked through a city environment. Luckily, you don’t need to hike in the wilderness to get these stress-busting benefits. Any green space, even a tree-filled neighborhood park, provides good medicine. Merely having a view of nature from one’s home or office has been linked to improved wellbeing and enhanced focus. High school students in classrooms with views of trees have been shown to learn better and perform higher on tests. In the workplace, employees with a view of nature have been found to be happier, more productive, and take less sick days. Washington County residents don’t have to look too far to find a vibrant natural area or tree-filled view. 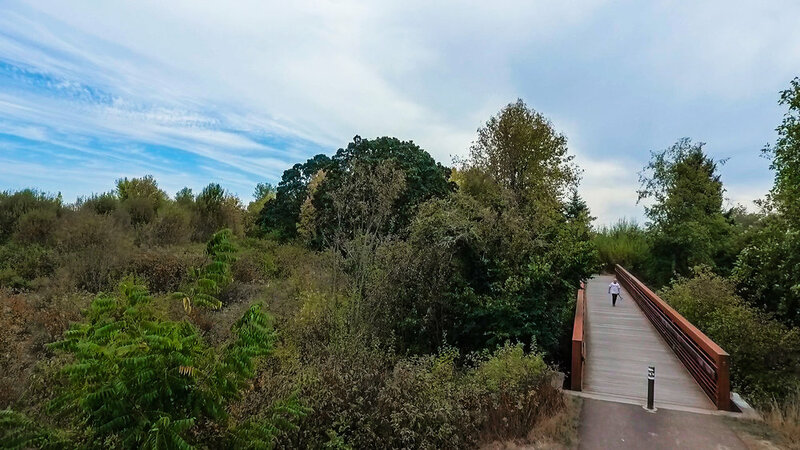 Tree for All’s landscape-scale restoration efforts have resulted in an abundance of opportunities throughout the Tualatin River Watershed to connect with nature – and that’s something we can all feel good about. Wolf, K.L., S. Krueger, and M.A. Rozance. 2014. Stress, Wellness & Physiology - A Literature Review. In: Green Cities: Good Health (www.greenhealth.washington.edu). College of the Environment, University of Washington. Tsunetsugu, Y., B.J. Park, and Y. Miyazaki. 2010. Trends in Research Related to “Shinrin-Yoku” (Taking in the Forest Atmosphere or Forest Bathing) in Japan. Environmental Health and Preventive Medicine 15, 1:27-37. Nedovic, S., Morrissey, A., (2013). Calm, active and focused: Children’s responses to an organic outdoor learning environment. Learning Environments Research, 16(2), 281-295. Paseos Verdes is improving community health while fostering the river stewards of tomorrow. 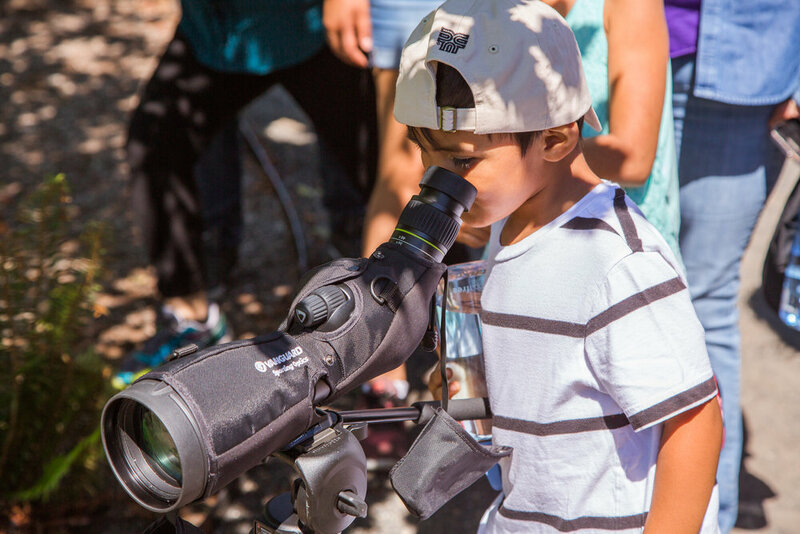 Clean Water Services, the Audubon Society of Portland and Bienestar Community Development Corporation are Tree for All partners with a history of working together to foster understanding of watershed health through the Bienestar Explorador Summer Camps Program. Over the last decade, the Summer Camps program has provided an opportunity for children and their families to build meaningful relationships with nature while learning about the workings of the natural environment. 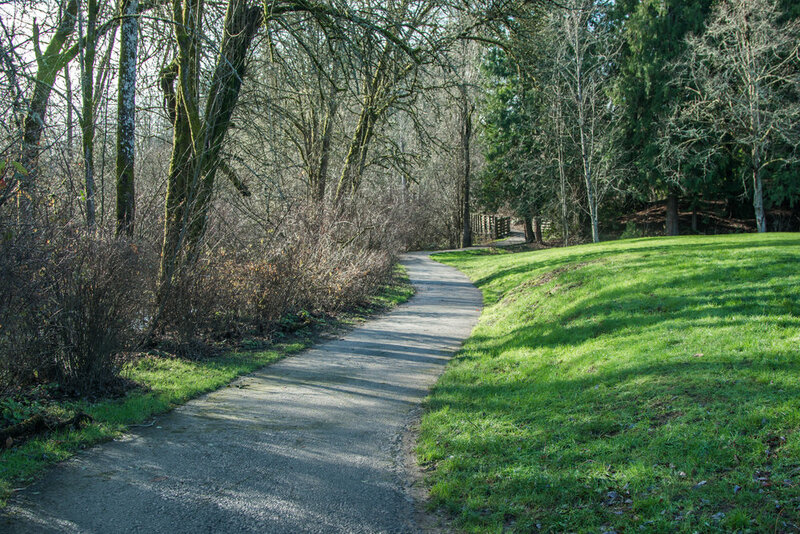 Spurred by the success of the Explorador program, the partners developed Paseos Verdes (“Green Walks”), a program that connects underserved community members to natural areas in Washington County through guided walks in the Tualatin River Watershed. Paseos Verdes is based on the simple idea that connecting the community with nature is good for the watershed and good for human health and wellness. The walks engage families to learn about watershed health, water management and wildlife. These experiences promote environmental stewardship while providing the health benefits of connecting with nature and being active in the outdoors. During the outings at Fernhill, just south of downtown Forest Grove, participants can often be heard exclaiming “I live nearby and I have never been here before!” while planning their next visit together. On one walk, children lined up excitedly to observe great blue herons and bullfrogs through a bird spotting scope while marveling that their bathwater could end up in such a beautiful place. On another occasion, a delighted grandmother spotted wild chamomile growing alongside the trail, and taught the group all about its uses in her native Mexico. The first year of Paseos Verdes has been a great success, and the response from the Bienestar community has been overwhelmingly positive. Working closely with Bienestar promotoras (community connectors), program participation has exceeded our expectations and families have been eager to sign up again. By providing culturally competent and engaging opportunities for Washington County residents to connect with the Tualatin River Watershed, Paseos Verdes is improving community health while fostering the river stewards of tomorrow. We are looking forward to expanding Paseos Verdes in 2018 and bringing on new partners to broaden the program’s impact on Washington County residents and the Tualatin River Watershed. Watch a short video of a Watershed Health Walk. Residents of areas with the highest levels of greenery were three times as likely to be physically active and 40% less likely to be overweight or obese than those living in the least green settings. In one study, elderly people who had nearby parks, tree-lined streets, and space for taking walks showed higher longevity over a five-year study period. Research shows that people who live near green areas are more likely to engage in regular exercise. Indeed, one of the major ways that nature benefits our health is by motivating and facilitating outdoor physical activity. Whether it’s walking a dog, riding a bike, practicing tai chi, or playing Frisbee golf — it’s more enjoyable, and more beneficial to our health, when we exercise outside. As modern lifestyles have become increasingly sedentary, there has been a sharp rise in obesity and associated chronic diseases such as heart disease, arthritis, stroke, Type II diabetes, high blood pressure, and certain cancers. The good news is that many of these conditions are preventable. Physical activity combats and prevents many chronic diseases such as diabetes and obesity, lowers blood pressure, burns calories, boosts metabolism, and even promotes positive self-esteem. Outdoor exercise also provides significant mental health benefits that indoor exercise does not provide, such as reduced stress and attention restoration. So how do we encourage our communities to go outside and get moving? By bringing Mother Nature back into our neighborhoods. Our environment has a huge influence on our exercise behavior. In fact, research shows that environmental interventions, such as establishing bike paths and walkways, are more effective at influencing physical activity rates than interventions based on information or media campaigns. By bringing Mother Nature back into our communities, Tree for All is also making our neighborhoods healthier by providing greener places to walk, run, and play. Explore the health benefits of Tree for All. Ellaway, A., S. Macintyre, and X. Bonnefoy. 2005. Graffiti, Greenery, and Obesity in Adults: Secondary Analysis of European Cross Sectional Survey. British Medical Journal 331:611-612. Takano, T., K. Nakamura, and M. Watanabe. 2002. Urban Residential Environments and Senior Citizens’ Longevity in Mega-City Areas: The Importance of Walkable Green Space. Journal of Epidemiology and Community Health 56, 12:913–916. Maas, J., R.A. Verheij, P.P. Groenewegen, S. de Vries, and P. Spreeuwenberg. 2006. Green Space, Urbanity, and Health: How Strong is the Relation? Journal of Epidemiology and Community Health 60:587–592. A single tree can absorb 10 pounds of air pollutants a year, and produce nearly 260 pounds of oxygen — enough to support two people. Children have lower rates of asthma when they live in neighborhoods with more trees. Researchers found that an increase in tree density of 343 trees per kilometer would be associated with a 29% lower prevalence of early childhood asthma. Researchers have valued the human health benefits of trees’ reduction of air pollution at 6.8 billion dollars a year. Plants and trees clean our water, soil, and air — making our environment a safer and healthier place to live. Our health starts with the quality of the air we breathe and the water we drink, so it stands to reason that our health is closely connected to our environment. While trees are often recognized for providing us with oxygen, they don’t get enough credit for also filtering the air we breathe. Trees remove harmful pollutants from the atmosphere, including carbon dioxide, ozone, nitrogen dioxide, and fine particulate matter. When we bring nature back into our neighborhoods, the air we breathe is cleaner and, in turn, our communities are healthier. Reducing air pollution particles has been shown to reduce the risk of stroke, heart disease, lung cancer, and lung diseases including asthma. In fact, US Forest Service scientists calculate that trees save more than 850 million lives a year and prevent 670,000 incidents of acute respiratory failure. Trees also clean up pollutants in our soil and water, protecting local water quality. By reducing groundwater runoff and sewage overflow — which can pose serious health hazards — trees provide us with healthier neighborhoods and make it more likely that we’ll get outside and enjoy nature. Lovasi, G. S., Quinn, J. W, Neckerman, K. M., Perzanowski, M., Rundle, A, (2008). Children living in areas with more street trees have lower prevalence of asthma. Journal of Epidemiology and Community Health, 62(7), 647-649. Nowak, D., Hirabayashi, S., Bodine, A., Greenfield, E. 2007. Tree and forest effects on air quality and human health in the United States.